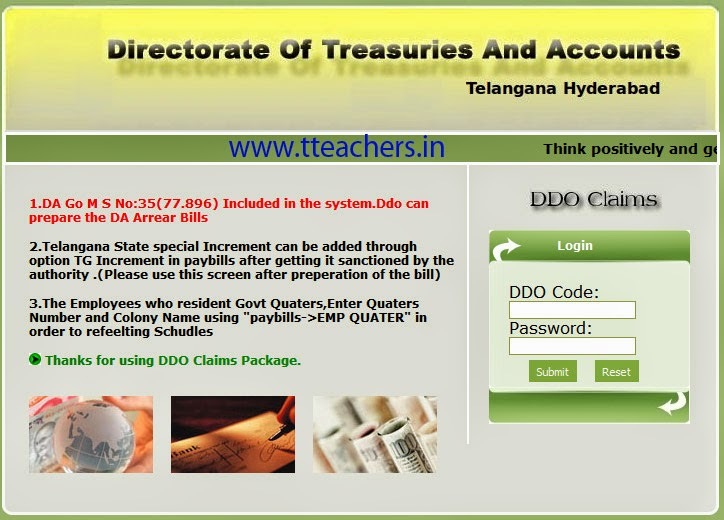 telangana state Government employees can submit their salary bills to directorate of treasuries and accounts Hyderabad official website https://treasury.telangana.gov.in/ddoreq/. DDO can submit their employees Pay Bill by entering their DDO Code and password. Telangana state Treasury website online is now available. Now we can do salary bill preparation at online official website of ts ddoreq. Telangana state all ddo can prepare and submit all government offices employees bill and can submit ddo request and can prepare employees salaries. DDO Officer will manage through salary options of telangana state employes salary billes and etc.. at official webpage. TS ddoreq employee's salary pay details like Basic Pay, DA, PP, FP, ZPGPF, GPF, GLI, Professional Tax GIS. By filling all options DDO can submit salary bills to Treasury of telangana state. How to submit ddo request for employee salaries in Telangana? Without ddocode and password you cannot login or access the website. So DDo's For Preparing ddoreq ddo request salaries pay bills you need to login with your ddocode and your secret password.